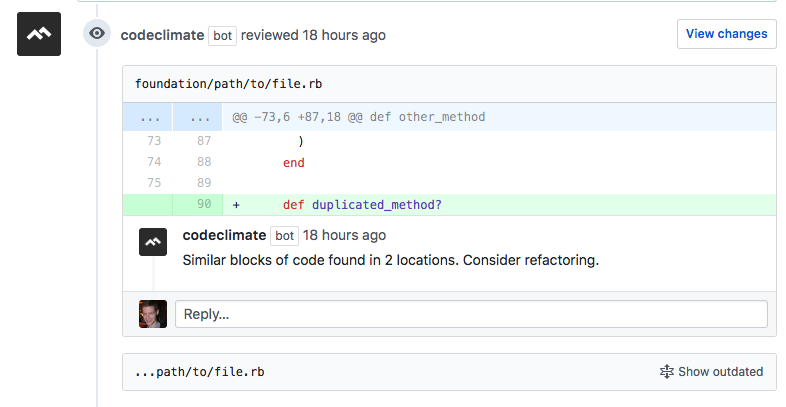 We are excited to announce a new way to integrate Code Climate with GitHub pull requests. In addition to our existing pull request statuses and browser extension, there are two new ways to bring Code Climate results into your pull requests: summary comments and inline issue comments. Summary comments provide an overview of the issue breakdown and test coverage changes introduced by the pull request. Inline review comments add issues directly into the pull request on the lines they are triggered. Please check it out here, turn it on for your pull requests, and let us know what you think.